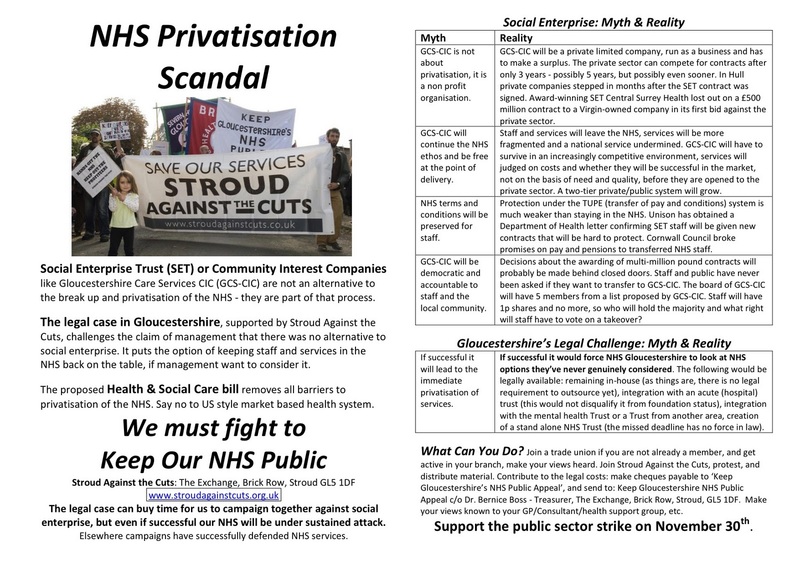 PHM-North America spoke with organizers and campaigners Hannah Basson, James Beecher, and Caroline Molloy from Stroud Against the Cuts about their campaign to prevent staff of the Gloucestershire National Health Service (NHS) from being outsourced to a private company. The campaign lasted from late 2010 through 2012, when the NHS withdrew its plan following legal action and heavy political pressure. Listen below to a conversation with the campaigners who discuss how they pulled together this hugely successful movement. In 2010 NHS Gloucestershire decided to move NHS staff out of the public sector into a “social enterprise”. If this decision went through, nine NHS hospitals and 3000 district nurses, health visitors, podiatrists, physiotherapists and others were at risk of being run and employed by a private company, instead of remaining part of the public sector. Campaigners also feared this move would ultimately result in Gloucestershire’s NHS community services ending up in the hands of a big private sector healthcare corporation such as Virgin, as had happened in Surrey. When local campaigners discovered what was happening they filed a legal action, with Michael Lloyd as the plaintiff represented by the firm Leigh Day. The action argued that the NHS could not make this change without the services going out to tender, or for open bidding. This was NOT what activists wanted, but it was a strategy to slow down the process and give them time to show to the community and NHS managers that outsourcing to a private company was not necessary at all. 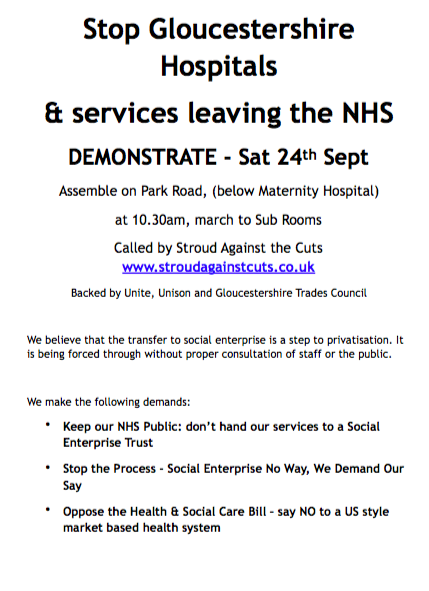 Stroud Against The Cuts (Stroud is a city in Gloucestershire County where most of the action took place) led the charge against this move by the NHS bosses. They spread the word and mobilized people to raise money for the legal case. Relying on a history of local political activism. Stroud is known to be the type of city where people will readily take to the streets to support local issues. This history of political engagement and activism in the city served as a strong foundation for organizers as they worked spread the word about the threat to their NHS. 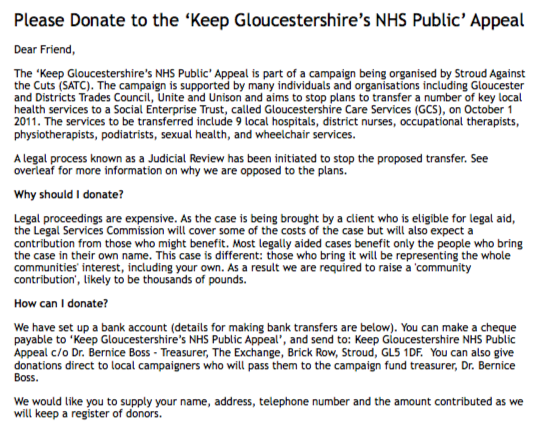 In February 2012, NHS Gloucestershire withdrew from the legal case, a big win for campaigners. But now they had to turn to the political battle. 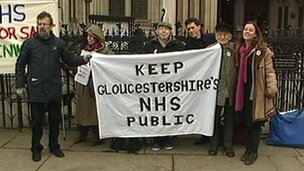 The campaigners began to put pressure on politicians by motivating people to take to the streets to save their NHS, holding public demonstrations in Stroud and other cities as well as at the local MP’s office. 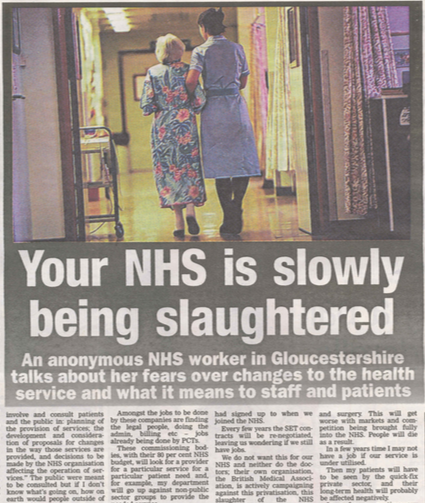 At the end of the campaign, NHS Gloucestershire staff were kept in the public sector and have not been outsourced. This was a huge win for protecting the health services in this community and also an inspiration for other movements across England where the NHS remains under threat. Hannah Basson, who works for the NHS in Gloucestershire, sounded the alarm as to what NHS bosses were proposing. She was horrified and also afraid—she couldn’t speak out against the actions at work for fear of losing her job. She reached out to local campaigners James Beecher and Caroline Molloy of Stroud against the Cuts. Hannah Basson published this citizen’s article anonymously, before connecting with James and Caroline from Stroud Against the Cuts. Click the image to see the full article. Hannah had no organizing experience. James had been involved in campaigns previously, but not in any campaign on health and not as a core organizer. Caroline had previously worked as a campaigner with unions but not related to health. They all learned more about the issue and its complexities, how to deal with politicians, the media and NHS managers, and how to reach people and mobilize people while actually doing it. 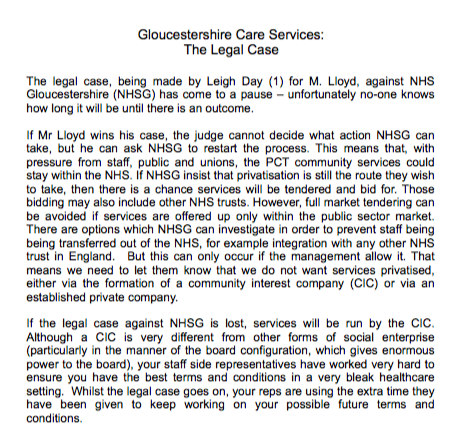 NHS Gloucestershire bosses were using this language to cover the fact that their decision would actually outsource services to a private, for-profit company and not the type of business, such as a cooperative, that would usually come to mind when people think of a social enterprise. One of the major challenges was correcting misinformation that was coming from NHS Gloucestershire, most often going directly to staff. See, for example, this letter from Gloucestershire Care Services to all Staff. They also used the term “social enterprise” very cleverly, to capitalize on the feel-good idea behind the cooperative spirit of what the public deems a social enterprise. In practice, however, the change would allow for the NHS services to be moved into a private company, threatening to undermine staff terms and conditions, patient care, and reduce accountability to the public. NHS representatives blurred the line between law and policy, giving the impression that their hands were tied and outsourcing the NHS staff positions to a private company was a must–even though this was only policy and not law. This was evident in union negotiations, where the union felt obligated to negotiate the best terms for staff under the new privatization agreement. Through the efforts of the campaign, Staff were fully informed of the details of the decision were able to discuss their concerns with the union. The language around privatization is difficult to understand and sometimes harder to explain. Campaign organizers knew this and organized public meetings where people could get their questions answered and be updated on what was happening. A few NHS staff did attend some of these meetings, but they remained very quiet and afraid of losing their jobs. Although local Labour and Green politicians supported the campaign’s efforts, the campaign still needed to explain the situation to politicians. They worked to identify and make good use of any political groups that sympathized with the cause and to bring them together. Caroline Molloy drafted a pledge that the organizers delivered to local MP, Neil Carmichael, for signing. The pledge was in support of “the right of NHS users and staff to have the choice for Gloucestershire’s community hospitals and health services to remain fully in the NHS, publicly owned and accountable.” The Stroud News and Journal reported that Mr. Carmichael did not sign the pledge saying it would mean committing to a position that is not deliverable. Campaigners also pressured Members of Parliament to commit to indisputable, cut-and-dry things, such as the need for transparency and public consultation in making the decision. This way, if politicians said they didn’t agree it would go over poorly with constituents. Whatever the MP decided, it was a win-win. None of the campaigners had experience being on TV, but the legal case and campaign gained national attention. This required television appearances, which was intimidating and for which none of them had training. A huge effort was put into developing messaging, to anticipate the questions they would be asked, and other tactics–such as moving away from the reporter’s question to what they wanted to say–to make sure they drove the focus of the interview and that their message was heard loudly and clearly. When it came to print news media, organizers were able to identify newspapers and journalists who were sympathetic to their cause. They drafted articles for publication, which the papers would not otherwise take the time to write and publish. In Stroud, they were able to identify and reach out to a local reporter who supported the campaign, reported on it fairly and frequently, and also pressured the local MP. Looking back, campaigners not only remember the immediate results of the campaign, but also its lasting impacts. After the legal case, NHS bosses were finally forced to consult staff and the public. 96% of the public, and 91% of staff opted to keep the organisation in the NHS – and the 4,046 responses to the official “engagement exercise”: were supported by a petition of 6,530 signatures. Campaigners outside of the High Court. Also, the relationship between the staff and the union has improved, and Hannah is now the secretary of her union. Caroline now writes about the NHS for openDemocracy. People in the community are much better informed about the problems in the NHS and current challenges. They are more active and vocal in putting pressure on their MPs to push legislation in support of the NHS. Caroline and Hannah noted that the social enterprise idea has died down a little bit. The two also point out that some MPs and NHS representatives now “roll their eyes a bit” when people mention Stroud Against the Cuts and that other counties are advised to “avoid the Gloucestershire trap”. Finally, the organizers are able to reflect on and appreciate the strong friendships they developed with each other as well as the confidence and skill they developed to continue in this fight.